Attire is pants optional. If you're not going to wear pants, we suggest shorts. Grilling in the backyard with a Lonely Blonde at your side is undoubtedly one of the best ways to enjoy a balmy summer evening. But when it gets really hot, sometimes we can't find enough motivation to even fire up the grill. 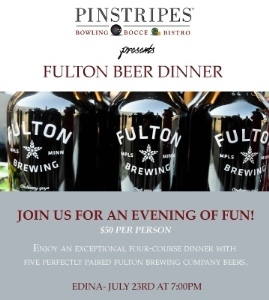 If you're in the same boat, here's some good news: we've paired up with some of our restaurant friends to prep 3 mouth-watering beer dinners to make sure nobody goes hungry -- or thirsty. 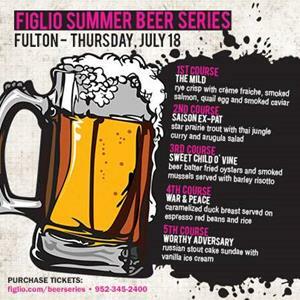 Figlio's summer beer series continues tonight with a pairing dinner dreamed up by chef JP Samuelson. We're bringing out some rare beers for this one, so if you haven't had our new Mild yet, you'd like your last chance of the year at the Expat Rye Saison, or you can't wait for this winter to have War & Peace or Worthy Adversary again, here's your chance. There are just a few tickets remaining, so if you're looking for last minute Thirsty Thursday plans, call this morning. 5 courses, 5 beers, all for $50. Last fall, Cocina del Barrio put on one of the best beer dinners we've ever been a part of. Everyone enjoyed it so much, it seemed only natural to do it again. Monday's lineup includes 5 beer and food pairings for $55. We'll be rolling out a few hard-to-find beers, including the Mild, Expat Rye Saison, and perhaps best of all, Libertine aged in 2 Gingers whiskey barrels. This is one of the last kegs of barrel-aged Libertine in existence. If that's not enough for you, we happen to know that Barrio has a second-to-none tequila lineup to complement your dinner. If all of that doesn't help you beat a case of the Mondays, we're not sure if anything will. FULTON BUILT A HOP FARM! Feel free to come up with your own hop pun here. Minnesota natives are probably familiar with the saying “Knee high by the fourth of July,” an old adage commonly used to describe the progress of growing corn. This year, we're learning that the same is true for hops plants as well. 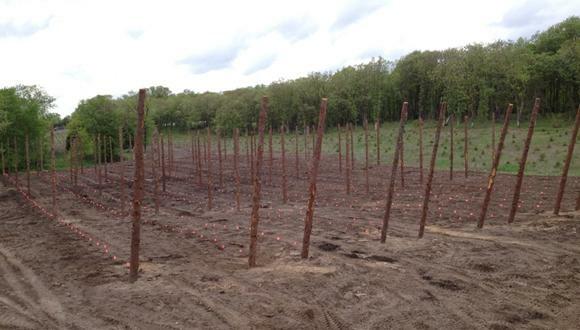 We've been looking into growing hops for several years, and this year, we decided to give it a try on a family member's land near St. Cloud. Despite the cold and wet spring, we’ve made great progress in the fields. Late in March, we cleared an acre of forest blowdown and erected over 75 tamarack poles, each measuring 20 feet high. 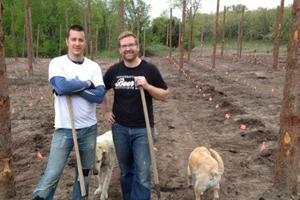 Our Cascade hop rhizomes arrived in early May, and before long we had over 1,000 plants in the ground. By the end of the summer, we’ll be building a water tower to supply fresh, clean central Minnesota spring water to the hop farm. Why did we choose Cascade hops? Cascades are hardy and prolific growers in Minnesota’s often challenging growing environment, and it’s also the primary hop we use in The Ringer Pale Ale. While we’re a long way from declaring hop growing independence, we hope our hop farm’s yield can be used extensively in our beers. From the looks on Brian and Jim's faces, they're ready for one of those beers any moment now. 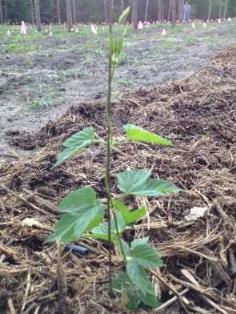 We’ll keep you updated as our hops continue to grow. If you’re interested in learning more about growing hops or lending a hand on the farm, please send an email to hopyard@fultonbeer.com.